Warren, together with fellow members who served on the U.S. Congressional Oversight Panel that oversaw financial crisis bailouts, wrote an op-ed piece for The Washington Post last Thursday. In her op-ed, she says the government should not allow AIG to carry over financial losses from before its bailout to lower its current tax bills and boost profit. On Mar 12, Warren also took aim at the insurer, telling reporters that she feels it’s time for Congress to end “the special tax break” for AIG. “AIG, a massive insurance company that received $182 billion in TARP and Federal Reserve bailouts during the financial crisis, reported in February that it had earned $19.8 billion in the fourth quarter of 2011. Its profits increased a staggering $17.7 billion — from a loss of $2.2 billion a year earlier — because of special tax breaks from the Treasury Department,” Warren wrote. Warren explained in her op-ed piece that companies must pay the appropriate taxes on their profit. But on the other hand, if they suffered a loss, they are allowed to carry forward that loss to reduce future tax bills. But to prevent abuse, U.S. tax law since 1986 has restricted carry-forward losses when a company changes ownership, she wrote. And for all intents and purposes, AIG changed ownership during the bailout — when the federal government assumed the controlling stake. Because of this change, AIG should not be allowed to record such a huge tax benefit as it did in the fourth quarter of 2011, Warren argued. “Beginning in 2008, however, the U.S. Treasury jumped in with a special ruling that the financial rescue did not constitute a change in ownership,” she wrote. This ruling now allows AIG to use its pre-bailout losses to avoid paying billions of dollars in taxes and book large profits, she argued. 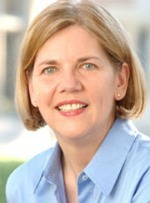 Warren is a bankruptcy law expert and Harvard Law School professor. She chaired the Congressional Oversight Panel for the 2008 U.S. Troubled Asset Relief Program and was also instrumental in creating the U.S. Consumer Financial Protection Bureau. She is currently a leading Democratic Party candidate for the 2012 U.S. Senate election in Massachusetts.